The Death and Life of Great American Cities. [New York]: Random House, . 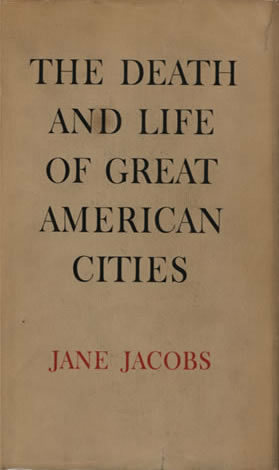 In The Death and Life of Great American Cities, Jane Jacobs questioned 20th-century urban planning policies that she believed led to the decline of cities. She called for new thinking in urban planning, with mixed-use, high-density, revitalized neighborhoods. Her work was inspired by her own neighborhood, the diverse Greenwich Village in New York. The Death and Life of Great American Cities was highly influential when it came out, and continues to be a seminal text in the field.